^ Moyer, Bruce A. (2009). Ion Exchange and Solvent Extraction: A Series of Advances, Volume 19. CRC Press. p. 120. ISBN 9781420059700. ^ Stacey, Weston M. (2007). 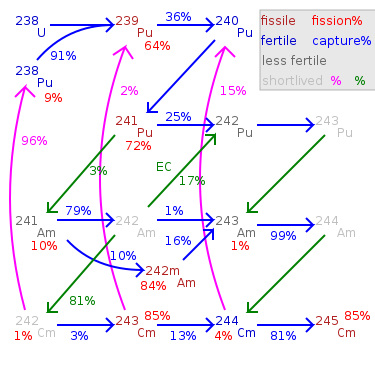 Nuclear Reactor Physics. John Wiley & Sons. p. 240. ISBN 9783527406791. ^ Raj, Gurdeep (2008). Advanced Inorganic Chemistry Vol-1, 31st ed. Krishna Prakashan Media. p. 356. ISBN 9788187224037. ^ Berthou, V.; et al. (2003). "Transmutation characteristics in thermal and fast neutron spectra: application to americium" (PDF). Journal of Nuclear Materials. 320: 156–162. Bibcode:2003JNuM..320..156B. doi:10.1016/S0022-3115(03)00183-1. ^ Etienne Parent (2003). "Nuclear Fuel Cycles for Mid-Century Deployment" (PDF). MIT. p. 104. Archived from the original (PDF) on 2009-02-25. This page was last edited on 16 February 2018, at 19:38 (UTC).